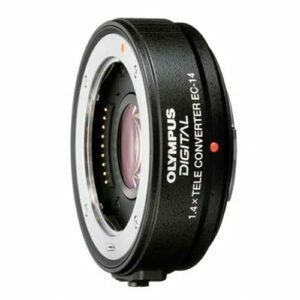 Lens Description: When you need more telephoto zoom in a smaller package, the EC14 1.4x teleconverter lens is an ideal choice. With only one stop of light loss, the 1.4x converter provides a fast super-telephoto experience whether you\'re taking sports shots or nature photography. With the Olympus EC14, you can turn your Zuiko digital 300mm f/2.8 lens into a 420mm f/4.0 lens (with a 35mm equivalent of 840mm at f/4.0)--a must for capturing the action on the field at a mega stadium. Overall, the EC14 is compatible with the Zuiko digital 14-54mm f/2.8-3.5, 50-200mm f/2.8-3.5, 300mm f/2.8, and 50mm f/2.0 (f/2.8 and up) lenses. Fully multi-coated to retain the high lens performance you expect from Olympus, this inexpensive lens still delivers professional-level results.